I have had this recipe for ham and pineapple melts bookmarked ever since I found it on A Year From Oak Cottage about a year ago and I have just been waiting for the opportunity to make them. Armed with my ham leftovers I finally got the chance and it was certainly worth the wait! Ham and pineapple is a classic flavour combination and one that I particularly enjoy. How could you possibly go wrong with smothering it with some melted sharp cheddar cheese? Lets not stop there though, when we can add some sweet and spicy honey dijon mustard and top it all off with a splash of Worcestershire sauce! These are so good! With the sweet, spicy, tangy, salty, warm, melted and gooey they have a magical combination of flavours and textures. I have already made them several times and they are quickly depleting my supply of leftover ham. I made them with whole wheat english muffins and they go great for any of breakfast, lunch or dinner or even as a snack. Spread the mustard on the english muffin and top with the ham, pineapple, cheese and top with a small splash of Worcestershire sauce. Broil until the cheese is melted and golden brown, about 2-4 minutes. Oh wow! look at the colour! this is perfect hangover food! Oh my word, I LOVE ham and pineapple pizza . . . this would be a great substitute! goodness gracious, i should have known better than to check this out at 10 at night, now i am going to have late night cravings for ham and pineapple melts and i have no ham in the house! It's not exactly the same, but when I was a teenager, I used to CRAVE a sandwich at Friendly's called Sizzled Ham & Pineapple. It hasn't been on the menu in decades, and I don't understand why. It's a perfectly scrumptious combination! I love a good Hawaiian pizza, so I can only imagine how fantastic this melt would be! And so much easier to prepare than a pizza, too! This looks delicious- and a great way to put leftover Easter ham to use! oh wow, the cheese melting on top of the pineapple.. that looks delicious. I read your blog from 2007 and I never have dared to comment. I simply adore what you are doing and these ham and pineapple melts looks absolutely delicious. I started to say I've never thought of pineapple with melted cheese, but then I love Hawaiian pizza, so I guess I have. These look delish! I love, it's easy and wonderful. Mmmhhh, so retro and scrumptious! Gotta love that! I love how this is like a Hawaiian pizza on an English muffin. Glorious. 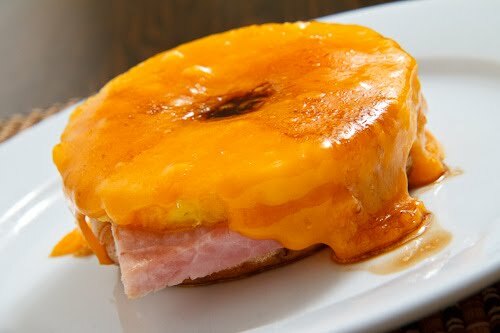 I love pineapple & ham together, and you can't go wrong with ham & cheese… so why not combine all three?! This looks delicious. Where is Dan? Kevin, not good looking! Gorgeous! This sounds like a spectacular combination. Yum! I'm definitely bookmarking this. Oh my. That looks wicked good, I would totally eat two. Heh. That is such a nice, simple, tasty idea it makes me slap myself and say, "Why didn't I think of that before?" This takes cheese, ham, and pineapple where they belog – in other words off of my pizza and onto a sandwich where they can stand on their own and not taint the pizza! What a gorgeous and interesting little treat! Ooh… this looks incredible! I love pineapple, and I am sure it would be wonderful with the salty ham and cheese. That looks so fantastic. I want. And as usual Kevin, your pictures are gorgeous! What about making this into pineapple sandwiches? The ham can either be above and below the pineapple, or the pineapple can be above and below the ham, depending on how much one likes ham or pineapple.